Intro from Barrett Golding: Next in our series of talks with Story-Making Machines makers is Cynthia Francis, US Managing Director of Audioboo, a social, sharing, sound storing and creation site. Transom: How does your web app help tell stories? CF: Audioboo gives everyone the opportunity to be a digital broadcaster. Teachers, journalists, podcasters and professional broadcasters use our social-sharing and broadcast-platform audio tools to record, edit, publish and store exceptional stories. Educators employ Audioboo to strengthen writing, improve reading comprehension, teach languages and connect with other schools around the world via the Audioboo community. From the local college radio stations to the BBC, broadcasters create playlists of past shows, with Audioboo’s embeddable player, to provide listeners a way to “catch up” on missed programs. Transom: What are a few of your favorite examples? 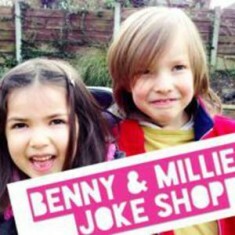 CF: One of my favorites is Benny And Millie, a young brother and sister raising money to make their home wheelchair accessible. They record a joke every day with Audioboo, then post it to their account and embed the Audioboo back on their blog. A Board (like a playlist) is for related posts within an account. A great example of this is the boards created by a group of teachers that have organized an account called Mapping Media to the Common Core. They have some wonderful content, including a board of Boo’s that capture the inspiration for why many of these teachers began teaching in the first place! A Channel is for regular content producers (podcasters, broadcasters, organizations, etc) it is useful to create a channel for all your content. Within the Channel, additional sub-channels allow specific programs to capture their own audience, and encourages their audience to comment back via Audioboo recorded comments. One of the best is the The People’s Songs. This BBC Radio 2 program plays a classic British tune, provides some historical background, then asks the audience for their stories related to the song, the artist or time. Audioboo’s player is embeddable, so works on your own website. 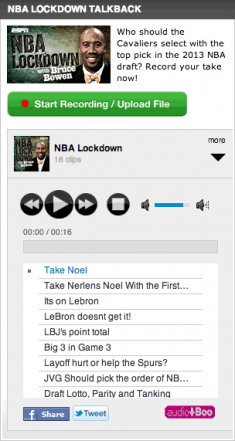 ESPN’s Podcenter is posting a specific question for the NBA Lockdown every day, and providing the Audioboo recording tools directly on their own website to capture a listeners answer or further question. There is a large community of visually impaired individuals that use Audioboo as a natural storytelling environment, as well as small towns that use Audioboo to capture their daily news and broadcast it to the town in lieu of a traditional radio broadcast frequency. The number of stories captured by Audioboo now tops 10M per month. Transom:Can the presentations at your site be embedded elsewhere? CF: Because the Audioboo created is an MP3, it can embed anywhere. Close association with Twitter and Facebook allows Audioboos to be seamlessly added to a post on those social networks, as well as in websites or blogs. The same is true of the Audioboo multichannel player: the BBC loads the player with episodes of their programs and uses it on their series’ sites. This ability to port content anywhere is critical for a social media tool provider. Transom:What makes your application different from other storytelling solutions? CF: Audioboo focuses on the spoken word. While we do have some music uploaded to the site, it is the story around the music we truly enable in a unique way. Our tools ease-of-use makes us a great fit for citizen journalists and others who want a quick, efficient way to capture high quality audio and port it multiple locations instantly. Transom:Any new features coming this year? CF: We are developing more robust editing tools for our professional and semi-professional users, such as the ability to trim clips and fade multiple tracks effectively. We continually add both back-end and user-features. Effective storytelling requires a strong mobile story: In the past 6 months we have added apps for Android, RIM, iPad and iPod. We also developed an auto-update player (out soon). Transom:What have you learnt about how humans tell stories? About how we view, read and hear them? CF: Storytelling is an inherently auditory process. Yes, you can read a story and still grasp the significance, but to really absorb an effective story one needs to hear it read, ideally by the story’s originator. Inflection, vocal tone and emotion all register in the voice in a truly unique way. Audioboo provides the platform for each of us to harness the power of our own voice and translate that into a shared social media experience. Transom:On what technologies does your product, and its embeds, depend? CF: The product was originally built in Ruby on Rails, and hosted in a data center in London. As we have grown, the core product has been ported to a .NET environment running in the cloud on Azure, provided by Microsoft. The Audioboo’s themselves are all MP3s, and are totally portable. You can embed the MP3 or Board (playlist of MP3s) or Channel (all your MP3s) on your own blog or website (Audioboo API at GitHub). Transom:Can your users export their work in any format? CF: Yes, it is really important to us that users of Audioboo retain the rights to their work, and have a totally portable file that they can take with them at any time. Good social media is not about creating proprietary silos of communication. We need to be able to engage in multiple communities and take our work, our ideas and our media with us when we leave, for whatever reason. At Audioboo, we encourage that independence. Cynthia Francis is the U.S. Managing Director of Audioboo. I’ve been a user of AudioBoo for several years and absolutely love the community that’s developed on the service. That’s what a lot of people don’t realise about AudioBoo. It’s not so much the service/software/cloud, that’s available in many other forms and frankly I feel SoundCloud does a better job of pulling that off but what AudioBoo has achieved is a real community of users which I feel the other services struggle to achieve. They have the social working, now if they can only get the other aspects operating well there is huge potential.